Plastic Propaganda’s show ‘Critical Narratives in Colour and Form (2)’ at the Kaleidoscope Gallery is an extended family affair, arising from a group of artists whose works reflect both shared concerns and individual preoccupations of body and intellect. Art like all of us, is born of contingencies and choices, decisions and accidents, full of surprises and disappointments, the mundane and the vibrant. And we all stand in relation to something. It is this relation to this something that teases away at the core of this work – to do with that (illusory) interface where stuff and ideas seem to meet; knead body and intellect together and stuff is idea is stuff. John Butterworth’s work has the impeccable credentials of painterliness to which Jon Law’s process based experimental images are cousins; The business of process is that of possibilities, the survival of the fittest, but with a democratic slant. Each product of the process offers an experience to be had. Nothing can be un-born. Ultimately though, the last to cross the line may prove the most interesting. To quote Bob Dylan, ‘….The slow one now will later be fast…’ and in that sense too the paradox of the postmodern demise of painting and its associated forms lies simultaneously in its opening up of possibilities. The apparent absence of figuration in John Butterworth’s paintings is an illusion that oscillates between the work as stuff in itself, physical, thick with the qualities of material, and image in the stuff. These paintings, heavy to varying degrees with paint jog the memory and return the its eye to past experiences. Flat monochrome colour contradicts itself with apparent space, into which the eye wanders. Plastic ridges of paint, vertical and horizontal, infer horizon, edge, anchor points where figuration insinuates itself into space as landscape, seascape, or the brightly coloured side of a beach-hut. 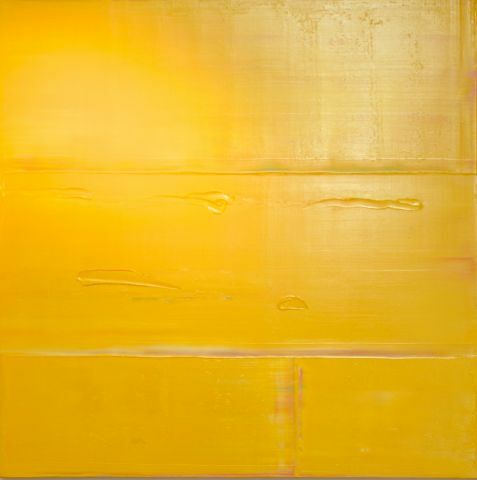 A large yellow painting, unlike the others, has palette knife marks. Mark Howland inhabits literal and metaphorical ground between Butterworth and Law. His paintings, based upon real places, but subject to evolutionary shifts in the making are multi-layered. Glazes settle on impasto. What could be reflections in water have no discernible origin; what ought to be a blue and white striped mug stands disproportionately large in the landscape. William Henry’s humorous use of league tables and betting odds takes a witty poke at the relative subjectivity of value. On the topic of the slow and the fast, His piece,‘Grand National Exhibition Sweepstake Kit’ offers odds of 10-1 for a Chuck Close (‘Intense personality with good connections. Tough sort who should stay well. ), Self Portrait, whilst ‘100 Years Ago’ – Peter Doig, (Goes well on quick ground but habit of dreamlike per-formances. Sure to find this company tough.’) runs at 40-1 Like its companion-piece, ‘Sun Art’ in which Henry appropriates Funtastic art stories, it is dated 1st April 0000. Amanda Thesiger’s work is constructed with a delicacy of touch close to understatement. A degree of knowing reserve invokes a sense of of deja-vu.We have been there, seen these things, perhaps as children? Her essences of memory, floating free from specifics of time and place are delicate cousins to the uncanny feel of Georgia Wright’s sculptural pieces. Exuding an air of sophisticated, teasing viscerality, tasteful material (oak, brass, rubber tubing) and finish are employed in pursuit of a frisson of decadence. Are these artifacts bound up in some private ritual? We expect them to twitch. Aya Mouri gently touches upon the universal. 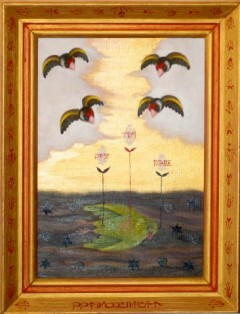 Her small paintings,in gold, greens, reds, black, evocative of religious pieces, are simply painted. Birds in arrested flight hang in the air, sustained by the faith that keeps them aloft. They look down upon one of their kind who has fallen. Wistful expression reflects the truth that one day they too will fall. 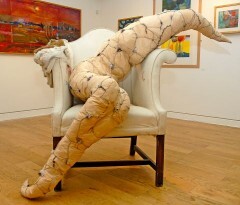 Heidi Yssenagger’s piece, ‘Bound’ a becoming female formed from stoma bags held together with surgical sutures, half – falls in forlorn discomfort across a damaged chair from which the stuffing spills. She is in mid-metamorphosis. Legs, knees, thighs, breasts signal her presence but where the feet might yet be a soft claw rests on the floor. No head either, a worm-like, pointed tip sways away as though in denial of its transformation. Stuffing finds its way through stitches; the absence of her arms testifies to a strait-jacket of helplessness..
Mavernie Cunningham’s woodcuts, deep black, sharp white, decorative but not decoration have a deliberately ‘unfinished’ bordering ingested from the printing process, which in a sense keeps them ‘real’, a nod to process and the presence of material. Angus Pryor’s piece, ‘Portrait of A Terrorist’ uses ‘…joke shop hair,noses,ears,beards….’ -(the ‘aesthetic’ is always ideological) in protest against the mindlessness and injustice of stereotyping, and was inspired specifically by the French government’s banning of the Burka. Plastic Propaganda is a hands-on project.